DRISCOLL BABCOCK GALLERIES presents John Fitzgerald Kennedy in commemoration of the 50th anniversary of the assassination of President John Fitzgerald Kennedy, November 22, 1963. The exhibition includes a gallery-exclusive video discussion of Felix de Weldon's BUST OF JOHN F. KENNEDY with commentary by John Driscoll and Tess Sol Schwab. The video is available to watch here. Felix de Weldon's BUST OF JOHN F. KENNEDY was commissioned by Jacqueline Kennedy and modeled by de Weldon, in plaster, from life in 1963. 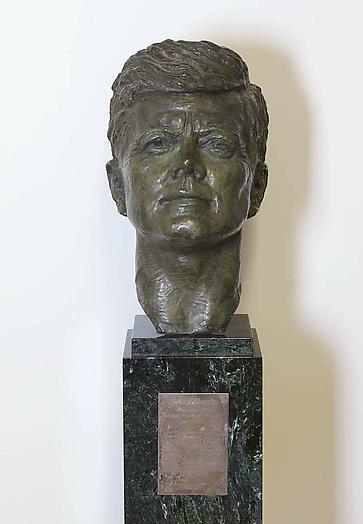 It has been stated that President Kennedy posed twice with de Weldon for this sculpted portrait, and that following the President’s death Mrs. Kennedy oversaw subsequent work on the piece until it was cast in bronze in 1968. It is believed that Mrs. Kennedy’s original intention for the sculpture was for it to serve as an official portrait bust of President Kennedy. To the best of our knowledge, only two bronze busts were cast from the original plaster model: one for the John F. Kennedy Library and Museum at Columbia Point, Massachusetts, and this one, for the artist himself. De Weldon’s obituary in The Guardian recounts Mrs. Kennedy’s poignant reaction of when she saw the finished bronze for the first time and reached out to touch the lips of the sculpture. This 17-inch tall bronze bust is mounted on an 8-inch square dark green marble plinth 52 inches tall, making a total height of 69 inches. The plinth is similar to the sculpture at Columbia Point, as is its sterling silver [?] inscription plate with an engraved quotation from the President’s Inaugural Address. A small group of archival materials including letters, copies of letters, a contract signed by Mr. de Weldon and Mr. Bernard B. Lynn, and a few other miscellaneous papers and items accompany the piece. 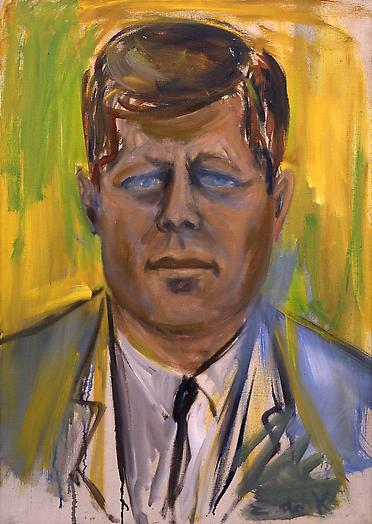 The exhibition also features Elaine de Kooning’s PORTRAIT OF JOHN F. KENNEDY, one of a series of portrait studies commissioned by the Truman Library in Independence, Missouri in 1962 to paint a portrait of President John F. Kennedy, Jr. Life sittings were commenced during the winter of 1962-63 in West Palm Beach, Florida and she worked on the portrait throughout 1963 until the President’s assassination in 1964, after which she stopped painting for an entire year. A substantial part of de Kooning’s career was devoted to portraiture, for which she was particularly known in the 1950s and 1960s. 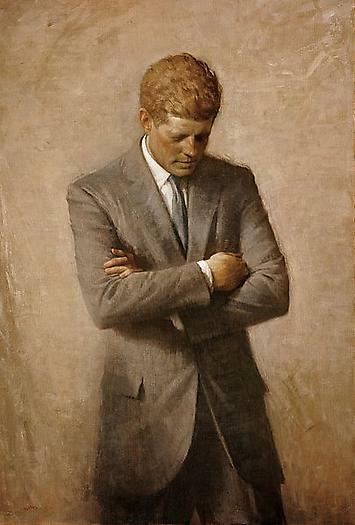 PORTRAIT OF JOHN F. KENNEDY was probably her most famous portrait commission, which she was trying to complete at the time of his assassination. During most of her career she had drawn and painted the male figure. She painted in series and tended to work on their creation for long periods at a time, and on many canvases within the same series simultaneously. When the image was transferred to her canvases, it disintegrated into fragments of pattern and color as the dashes of greens, lavenders and yellows re-created the experience of sky, figure and forest dissolving into the fracturing sunlight. John Driscoll and Tess Schwab of Driscoll Babcock Galleries discuss Felix de Weldon's sculpture of John F. Kennedy. 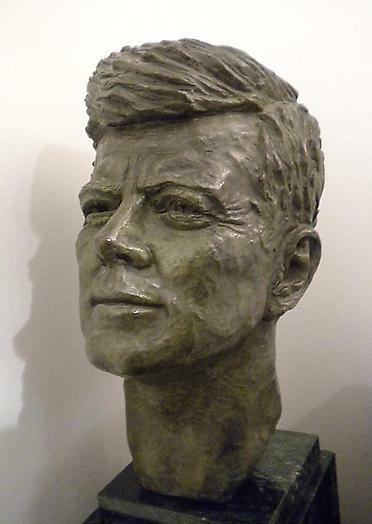 BUST OF JOHN F. KENNEDY was commissioned by Jacqueline Kennedy and modeled by de Weldon, in plaster, from life in 1963. 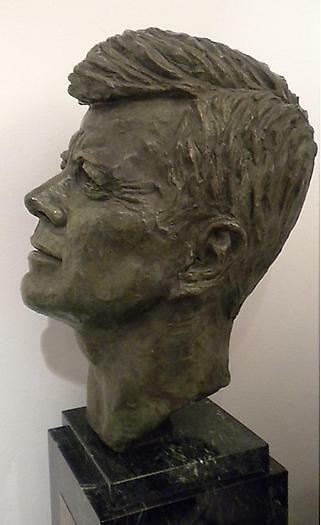 It has been stated that President Kennedy posed twice with de Weldon for this sculpted portrait, and that following the President’s death Mrs. Kennedy oversaw subsequent work on the piece until it was cast in bronze in 1968. It is believed that Mrs. Kennedy’s original intention for the sculpture was for it to serve as an official portrait bust of President Kennedy. To the best of our knowledge, only two bronze busts were cast from the original plaster model: one for the John F. Kennedy Library and Museum at Columbia Point, Massachusetts, and this one, for the artist himself. De Weldon’s obituary in The Guardian recounts Mrs. Kennedy’s poignant reaction of when she saw the finished bronze for the first time and reached out to touch the lips of the sculpture.